Chava White, Evan’s mom, provided testimony to the Senate Finance committee on behalf of the ARC of Texas and Evan. (testimony below). In addition to her testimony, committee members were given a copy of the video Saving Evan White. My name is Chava White; I live in Houston Texas with my husband Allen and my children, Evan (21) and Rachel (28) I planned to be here today to testify for your support the DADS Exceptional item to fund a Hospital Level of Care Waiver program. Unfortunately, I found out last night that the item was dropped from the agency’s exceptional item list. I chose to testify today to ask that you still consider appropriating additional funding for this program or a program so that I can continue to save my son. Evan’s life. I am here representing myself as well as The Arc of Texas. I am very grateful for this opportunity to provide testimony. My son, Evan, suffers from a rare genetic disorder, familial dysautonomia. This disorder affects the autonomic & sensory nervous systems—the parts of the anatomy that control the most essential aspects of living: blood pressure regulation, digestion, swallowing, and sensitivity to pain, heat, and cold. Evan’s body is like a building without a thermostat .The essence of Evan’s disability is a body which lacks ability to regulate itself. Evan requires on going care and monitoring helping him maintain autonomic balance. His ‘daily routine’is provided on a ‘judgmental’ basis .This has been our challenge: saving Evan’s life each and every day. His nurse is essentially his autonomic nervous system, with ongoing interventions & specially designed protocols and doctor’s orders inclusive of narcotic medication administration. This care has minimized Evan’s need for very expensive visits to the hospital. Even in the hospital; his nurse is an essential part of the care team. Evan was qualified for the MDCP waiver program when he was 4. He was able to have all his needs met by this program. In 1997, changes in the MDCP program created a void in Evan’s access to the nursing care. With the help of Advocacy, Incorporated and Representative Scott Hochberg, Evan was able to access the CCP program which provided him with the nursing services he needs and that were missing in the MDCP program. I placed him on the CLASS and the HCS waiting lists so that he would have more options when he turned 21. In 2006, Evan was offered a slot on both the CLASS and the HCS Medicaid waiver programs. I took great care to examine the 3 Medicaid waiver programs he qualified for. To my great disappointment, I discovered that there is no program available in our great state that will be able to meet Evan’s care needs once he was 21. I had to choose. I chose the CLASS program. The CLASS program supports Evan’s community integration. The CCP program has continued to cover Evan’s complex medical needs. Evan turned 21 in November. Evan’s care needs exceeds the funding cap in CLASS. An application for GR funding that is a part of rider 45, was made. I received a letter from DADS on Monday indicating that the request is denied because according to them Evan can have his needs met in a nursing home or state school. On Tuesday, I received a CLASS decision that essential life saving supplements are not covered . At this time, our CCP extension is good to March 31st. Our lives are now on ‘stand-by’. Senators, I am beside myself. How is it that our great state has been providing for Evan’s care until now but there is not a program in place to continue to do so? My husband and I have worked very hard to care for our dear sweet Evan, not just to keep him alive, but to live a life of dignity, productivity and of quality. We are completely dedicated to his needs and we want to continue to care for Evan as long as we can. I urge you, please support/create/ a way to care for continuing for our developmentally disabled and medically complex children aging out of other services. This is a critical need and it will be a small program. Don’t abandon my Evan and others whose lives you have been saving. I thank you for your serious consideration for continuation of this life saving care. 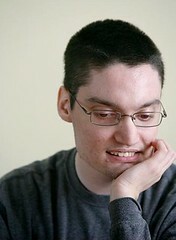 Evan, our family, the other young adults facing this challenge are depending on your support.